Gel coat is the most common surface coating used in the fabrication and repair of fiberglass reinforced products. Gel Coat is a specially formulated two-part polyester resin that is designed to be the first layer of resin applied in a mold when making a polyester or vinyl ester composite part. It is intended to create an opaque surface which will completely block glass pattern show-through. Polyester resins in general, and specifically gel coats, are naturally UV resistant and properly cured parts can be submerged in water. Most boats are made using gel coat with polyester resin and fiberglass. Composite parts are generally made in a female mold. The gel coat would be applied to a prepared mold surface and then backed with layers of reinforcement (usually fiberglass) and additional resin. When the part is removed from the mold, this gel coat surface would be the exterior surface of the part. A red boat is usually red because the fabricator used red gel coat. While gel coat can be applied by brush or roller, we strongly recommend the use of spray equipment. Fibre Glast offers spray guns specifically for gel coat. Item #126-A is a gravity fed HVLP-style gun that features a 2.5mm nozzle, which is an excellent starting point for spraying gel coat. The #126 gun is suitable for both small and medium areas, typically medium repairs and small parts/molds. Item #134-A is a pressure fed HVLP style gun. It features a 3.0mm nozzle and can be used for medium sized projects, typically a large repair or medium sized part or mold. Finally our #120-A Gel Coat Cup Gun is a dump gun. There are a variety of nozzle sizes available for different materials, but the primary use of this gun is to quickly apply gel coat to large areas. It is most frequently used for new part and mold construction rather than repairs. Gel Coat Cup Gun This unique Gel Coat Cup Gun has become the standard for producing small-to-medium sized parts with a limited equipment budget. 0.6 Liter Gel Coat Touch-Up Spray Gun This versatile Gel Coat Touch-Up Gun allows you to adjust the spray width and volume to tackle small and large surface area jobs. 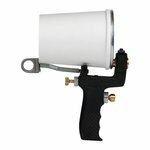 1 Liter High-Pressure Gel Coat Spray Gun Ideal for large repairs and small to medium projects, with a wide variety of patterns and pressure adjustments to suit your needs. Coverage will vary depending on application techniques and desired thickness. Typically, however, one gallon of gel coat will cover between 40-80 square feet at 20-25 mils. Since gel coat was designed for in-mold applications, the process is straightforward and relatively simple. Gel coat is usually sprayed into the mold in several thin passes. After the MEKP hardener is added, there is generally about 20 minutes of working time before the gel coat will begin to harden. Some fabricators like to thin the gel coat before spraying and will add pure liquid styrene (also referred to as Styrene Thinner or Monomer) to the gel coat. Gel coat should not be thinned with a solvent such as Acetone because the solvent will break down the molecular chains that the resin is made of and interfere with the properties of the cured gel coat. Duratec Clear Hi-Gloss Gel Coat Additive can also be used for tooling and in-mold applications. When using the Duratec Hi-Gloss Additive in these applications, blend at a 15% ratio to upgrade mold and part surfaces, improve gloss retention, increase impact resistance, and reduce heat distortion. Ensure that your mold surface is properly prepared and has a Class 'A' finish. For more information on this, please see our Learning Center article- Plug Surface Preparation and Mold Surface Maintenance. Thin gel coat to your preferred viscosity using #70 Styrene Thinner or #70 Styrene Thinner or #1039/1040 Duratec Clear Hi-Gloss Gel Coat Additive. Catalyze gel coat with #69 MEKP at 1.5%. Mix thoroughly to ensure that all gel coat is properly catalyzed. Apply gel coat to mold surface. Spraying gel coat is recommended for more accurate and consistent coverage. Apply gel coat in 4-5 layers at approximately 5 mils each, allowing 15-20 minutes between layers for a total thickness of 20-25 mils. Use #122-A Gel Coat Thickness Gauge to ensure proper thickness is achieved. Once gel coat has tacked up, about 20 minutes after final layer has been applied, lay-up of the part can begin. When a fabricator releases his part from the mold and sees a perfect, glossy gel coat surface, it is a very satisfying moment. Since the gel coat has been backed by subsequent reinforcement and resin, it can't be seen until it is out of the mold. Gel coat is now part of the final composite. It is not a "coating." It has cured with the part, allowing it to bond both chemically and mechanically. In a properly fabricated and cured part, the gel coat should not delaminate nor should the gel coat "chip" off from the surface because it is not a surface coating. If you are making a polyester or vinyl ester part in a mold, using gel coat is highly recommended as the proper material for the exterior surface. Fibre Glast offers over 900 colors of gel coat for you composite parts. Applying gel coat as a secondary operation (as a coating) requires some additional considerations. Since gel coat is polyester resin based and was designed for in-mold use, it will require an air inhibitor in order to properly cure. Air inhibitor options include #1039/1040 Duratec Clear Hi-Gloss Gel Coat Additive, #71 Styrene Wax, and #13 PVA Release Film. #1039/1040 Duratec Clear Hi-Gloss Gel Coat Additive is the preferred choice for any marine application above the water line. This additive improves gloss retention and impact resistance, as well as acting as the air inhibitor and thinner. 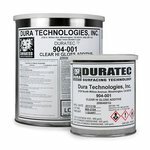 Duratec Clear Hi-Gloss Gel Coat Additive is added at a simple 1:1 ratio. Mix Duratec Clear Hi-Gloss Gel Coat Additive to the gel coat prior to adding catalyst. Catalyze the material at 1.75% with #69 MEKP. Once application is complete, no additional steps are necessary. #71 Styrene Wax can be used as the air inhibitor in virtually any situation. It is added to the gel coat at a ratio of 5% - approximately 1-2 tablespoons per pint of gel coat- and applied with the final coat only. The wax solution rises to the surface during the curing process and protects the gel coat from the atmosphere. Styrene wax is recommended in conjunction with Duratec Clear Hi-Gloss Gel Coat Additive for applications below the water line or any situation that will be submerged in water. For a glossy finish, Styrene Wax will need to be sanded off with 400 grit sandpaper once the gel coat has cured. After the sanding has been completed, several coats of polishing wax or compound will create a durable, high-gloss finish. #13 PVA Release Film can also be used as an air inhibitor. Simply spray the PVA onto the gel coat and allow to cure. The timing of the application of the PVA is important. The gel coat needs to crosslink with itself right from the start without interference from the atmosphere. Applying the PVA right after you spray the gel coat will also trap styrene in the gel coat and prevent it from evaporating, thus aiding the curing process. Once the gel coat has cured, the PVA can then be washed off with soap and water. The first step is determining if gel coat is the appropriate coating. Often times, gel coat is not ideal for your repair. Gel coat is not compatible with epoxy resin systems. Unless your project will be below the waterline or constantly submerged, paint may be a better choice. In these cases, our ChromaGlast Paint is a more suitable option. For assistance in deciding which coating to use, read our Learning Center Article ChromaGlast Paint vs. Gel Coat. Surface preparation is critical when applying gel coat to a finished component. Unlike the in-mold application, applying gel coat to a finished product relies solely on a mechanical bond. Ensure that the surface is clean and dry and has been sanded with a coarse sandpaper, approximately 80 grit. Thin gel coat to your preferred viscosity using #70 Styrene Thinner or #1039 Duratec Clear Hi-Gloss Gel Coat Additive. When using styrene thinner, add to gel coat at 2-5% to lower viscosity and aid in spraying. Duratec Clear Hi-Gloss Gel Coat Additive is added at a 1:1 ratio. For all applications below the water line, add #71 Styrene Wax at 5% and mix thoroughly. Catalyze gel coat with #69 MEKP at 1.5%. If you are using Duratec Clear Hi-Gloss Gel Coat Additive, adjust catalyst to 1.75%. Mix thoroughly to ensure that all gel coat is properly catalyzed. Apply gel coat to your part. 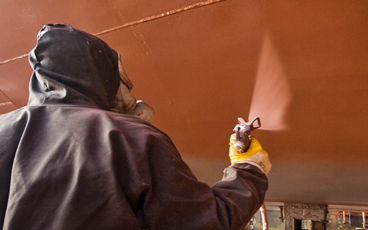 Spraying gel coat is recommended for more accurate and consistent coverage. Apply gel coat in 4-5 layers at approximately 5 mils each, allowing 15-20 minutes between layers for a total thickness of 20-25 mils. Use #122-A Gel Coat Thickness to ensure proper thickness is achieved. If brushing or rolling gel coat, sanding will most likely be required in order to get an aesthetically pleasing final surface finish. Start with 240 grit sandpaper (#968-A 3M™ Wetordry™ Sandpaper) and gradually move to 600 grit sandpaper with each successive sanding. Buff and polish your new gel coat to a professional-looking finish. Selecting the right color for your project, especially if you're trying to match an existing color, has its own challenges. 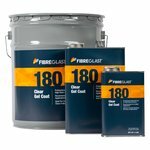 Fibre Glast offers over 900 colors to choose from. Our #4009-A Instint Color Book has 720 available colors and our #4008-A RAL Color Book has 188 standard international RAL colors. These color books can be purchased or rented to better help you with your color selection. Even though we display many color options on our web site, not all monitors and screens are the same. These color books will provide you with the most accurate representation of the gel coat colors that we offer. Color books are shipped with a prepaid return shipping label and are only available in the contiguous 48 states. Simply find the color that matches your existing finish and place your order. All orders are custom mixed for consistent, high standard, perfectly matched color every time. The Fibre Glast Non-Skid Rubber Particles are ideal for creating a durable, safe, non-skid surface to any gel coated or painted surface, such as a boat deck or patio. They are also ideal for skate or surf board surfaces, sporting equipment handles, and much more. Rubber particles form a more comfortable and durable non-skid surface than silica sand, and create a lasting texture that can withstand extreme traffic. These rubber additives are available in two particle sizes, our #4202 Fine Grit is ideal for surfaces in contact with bare feet or hands, whereas our #4203 Medium Grit is perfect for surfaces where footwear is worn. For fast and easy application, particles can be mixed directly into gel coat before application and applied with a roller, sprayer (2 or 2.5 mm or larger nozzle), or brush in single or multiple layers. For a more controlled, denser texture, particles can be broadcast onto wet gel coat until refusal, and protected with an additional layer of gel coat. We recommend a mix ratio of 1:8 (1/4 pint of rubber particles per quart of gel coat) if you are using the direct mix application. For a broadcast application, use 3-4 quarts of fine particles, or 4-5 quarts of medium particles per 100 ft²; loose particles that are recovered after cure can be reused on your next application. Glitterflake is commonly used to repair damaged bass boats or to give any project a glittery surface. 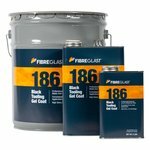 Choose from silver (#879-A), gold (883-A), red (882-A), or blue (881-A) Glitterflake, and add to a clear, high-gloss gel coat, like our #180 Clear Gel Coat, for a surface layer that grabs the light. Glitterflake delivers best results when used as one of three layers: at its base, a layer of gel coat with pigment to conceal reinforcement below; a layer of Glitterflake mixed with clear marine gel coat; and, a protective layer of clear gel coat at the surface of your part. Apply layers in this order for boat repair, for example, and opposite when applied in-mold. For a more in-depth discussion, see our Learning Center article Using Glitterflake. While techniques and applications vary, by following the steps and guidelines outlined above, you will greatly increase the probability of a successful project. In the event that you do experience any issues, our Gel Coat Troubleshooting Guide can help you resolve the most common problems associated with gel coat application. If you still have questions regarding the products or processes, please contact us at 800-838-8984.